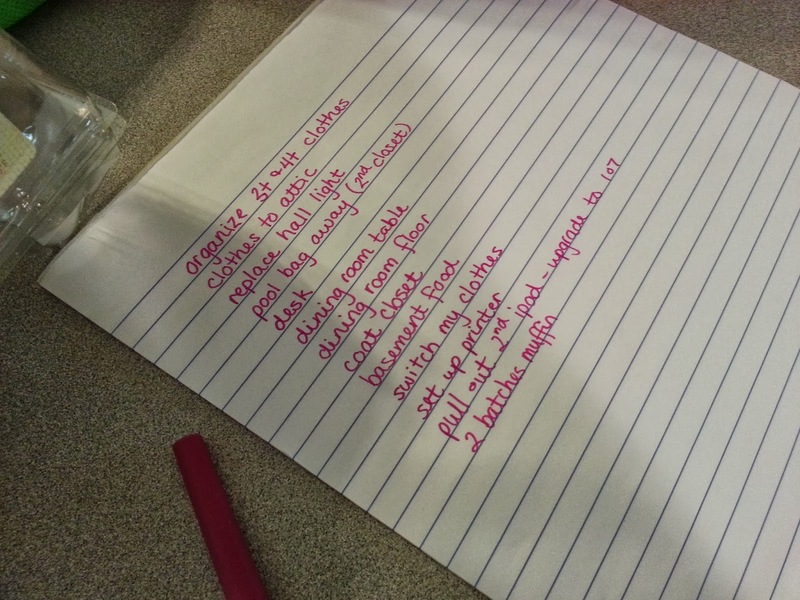 From Meredith to Mommy: When in Doubt, Make a List! When in Doubt, Make a List! Remember my friend Sarah, who writes an awesome blog? (Not Sarah "Awesome Mother's Helper". I blabbed on about missing HER just last week). Maybe not. I've mentioned her before, but since I can't even remember when or which post, I certainly don't expect you to have a mental catalog of everything I've ever referenced. Anyway, Sarah was one of my college roommates, and she's currently living in NYC. She acts, she sings, she blogs, she writes, she does all kinds of creative things. Her last post was on the lists she makes, and it made me laugh, because when the email alerting me to her post came in, I was in the middle of writing a list of my own and thinking about how I should blog about how the more I have to do, the more determined I am to write it all down and add crazy amounts of extras. (By the way, I stopped making my list when the email came in. I immediately read the post. Because I've been Pavlovian-style conditioned to check my phone when it dings. But that's a topic for another day). I love lists. Love, love, love lists. 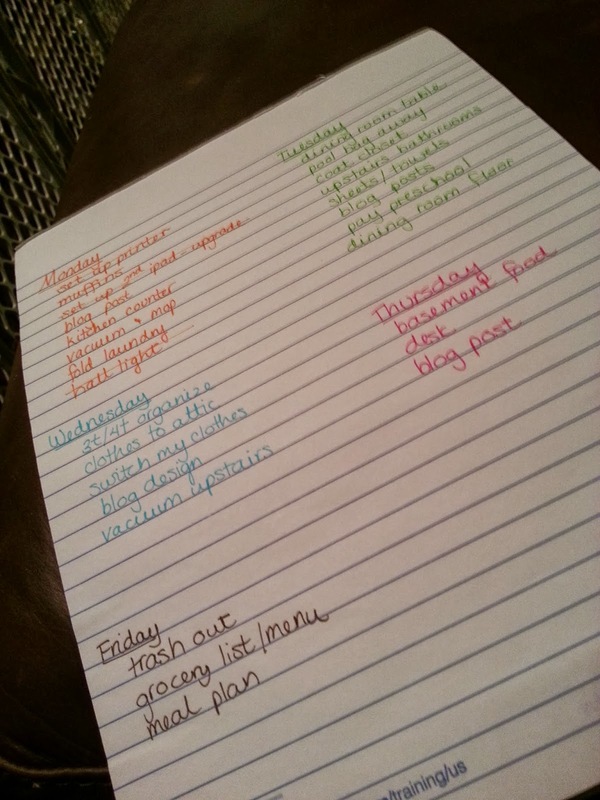 Go check out Sarah's post on how much she loves lists. Go ahead, I'll wait. Sarah and I are kindred spirits in this regard. I make lists all the time. Shopping lists, errand lists, daily to-do lists, lists of blog topics, if you can categorize it, I've probably made a list on it. I make them on my phone, I make lists on scrap paper, I make lists on the "sticky notes" on my computer. But, like Sarah, to me there is nothing like a legal pad list. I might not have a lawyer in my life, but I do have someone who seems to have an abundance of legal pads they are willing to share. What's backwards about my list making is that I save my most ambitious lists for the most ridiculous times. Let's take this week. Adam left this morning for a weeklong trip to Texas. He won't be home until late night on Friday, and then, again, has a golf event first thing Saturday morning. So from breakfast today until Saturday afternoon, I'm on my own. Great week to make a long list of projects, right? This is the list I started to make on Sunday. A list of things I'd like to get done this week. You know, in addition to my regular schedule of cooking and housework and laundry. Granted, some of those things won't take much time. Replace the hall light? Easy (and ahem, something I've given up on bugging Adam about). But our dining room is a disaster. It is the one place that is constantly, truly, gated off, and therefore the only "safe place" in the house. This was initially because it housed the china cabinet and the wine rack. So naturally, it has become the dumping ground for anything we don't want the girls to have access to. Purses, golf clubs, gifts for other children, art materials that require supervision - all over the gate. Regular visitors to our house know that if you want to make sure your bag isn't rifled through, you put it in the dining room. This means that it quickly becomes a disaster area that we can barely walk through, and when it becomes too awful, so bad that we're embarrassed, I clean it. That time is now. Has to get done. So it's on the list. But it's not a quick item. Not an easy one to cross off. Satisfying to have it done, but tough to work for a long time and get to make one measly line through a chore. I make lists because there is something completely satisfying about crossing off an item, and seeing those to-dos get done. In fact, if I have to do something that I didn't put on the list, I will add it, just so I can immediately cross it off and feel satisfied. This list was bugging me, so I made some changes (because organizing the list trumps actually doing anything on the list). I color coded it. So much cuter, right? And I left extra room, in case I need to add anything, like "wipe peanut butter off the oven where Reagan used her leftover sandwich as paintbrush". You know, in case that comes up. And I broke down a few chores. So I could cross off four or five things for one big chore. More lines = more satisfaction. So now that I've gotten a good part of my Monday done, I made another list, a la Sarah, for the rest of my Monday night. Watch at least two old episodes of "Next Great Baker" on Netflix. Now that is a list I will truly enjoy! I think, to be truly efficient, I may even take the Kindle, dessert and wine in the bath with me. After all, I'm alone this week. I need to combine tasks. All in the name of organization! Are you a list maker? Does it satisfy you or stress you out? Are you a big job lister or little things lister? Or is it just me?